Our Museum Opulence Collection, Gift Set, includes Four sophisticated Glass Coasters, that are shaped like elegant classic squares, with a magical, very light green tint, in the glass! 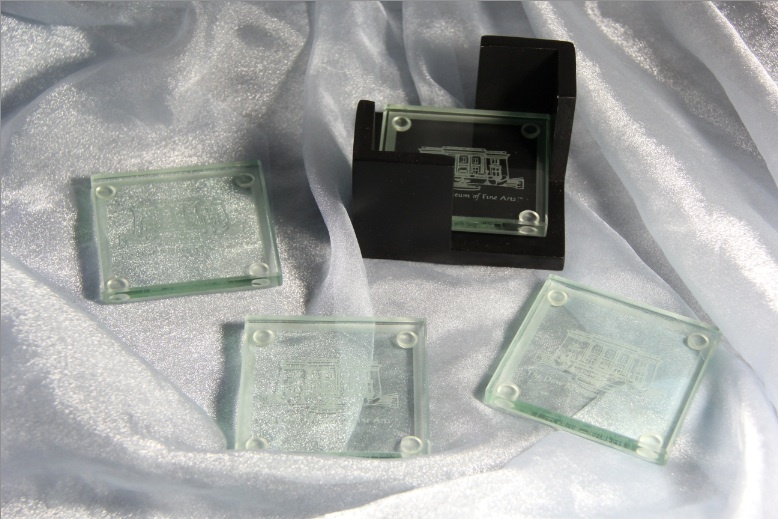 We treat each, of our Glass Coasters Gifts Sets, like royalty, by magnificently showcasing them, in a rich, sleek, black noir, stand! This exquisite, modern classical gift set, can be used for any, and all, of your favorite drinks or beverages! Being Present is a way of life, and must be practiced every day. As you practice, being more present in your daily life, you will experience a life of being more intentional, in everything that you do! Which includes, having a higher level of consciousness and awareness, even as you sit on the sofa, while drinking a glass of your favorite organic juices, bubbly water, coffee, or teas, or perhaps, even a romantic glass of champagne! Our magnificent Museum Opulence Collection, will remind you, to be present! All of our Art Collector’s and Art Lovers, enjoy placing them, and admiring them, on their coffee tables! Even when you are not using them, they are such captivating pieces of art, for everyone’s coffee table, dining table, or even end tables! As the light passes through, the exquisitely tinted glass, such refined beauty, and elegance, will remind you, to be present! Our sophisticated Museum Opulence Collection, Gift Set, will add grace, nobility, and prosperity, into your life! Each and every day, you will see, using your favorite coasters, is an incredibly magical experience! It’s also very good feng shui, to be more intentional, and refined, by using a coaster with your drinks and beverages! Having good feng shui, always brings you good luck! These refined, lightly tinted, glass coasters, make the perfect gifts, for your dearest loved ones; and an art collector’s delight! As you are using and touching, our museum glass coasters, it’s such a lovely way, of reminding you to be present. It’s an incredibly magical experience; such exquisite beauty promotes presence. Our Museum, Opulence Collection Gift Set, is absolutely breathtaking! Awe-inspiring, classical elegance and refinement! This exquisite set, makes a perfect gift, to treat yourself; or to treat your dearest loved ones! Our beautifully, refined, Museum Opulence Collection, Coasters, 5 Piece Gift Sets, are exquisite, durable, practical, and of course, made in the USA. 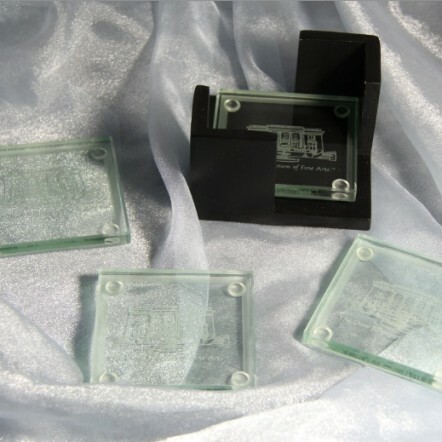 Five Piece Gift Set includes: 4, lightly tinted, light green, glass coasters; with a rich, sleek, black noir stand.